Aside of coconut, honey is my other obsession in life. I love the taste, the smell and even the texture of honey so was delighted to try the lovely . A honey serum, is for me, a marriage made in heaven as serums are another obsession of mine. This one has a thicker consistency than your average serum, but is quite light in texture. Once applied is quickly absorbed by the skin. It has a very fresh smell and feels great on the skin – not sticky or heavy. Applied at night, skin feels nourished and happy in the morning, although alone I don’t think is enough; I combine with an oil or lighter cream in my arsenal. For day, it is pretty good; because it is quite light it behaves well under makeup, living up to its “primer” name, although I don’t feel it enhances durability. It contains peptides, which stimulate collagen production, hydrating British honey, antioxidant-rich propolis and firming blackcurrant seed oil and larch extract, which all combine aim to smooth the skin and help with ageing signs. Bee Good is one of those companies you can’t help but fall in love with; they use British honey and botanicals, have an eco conscience, are free from synthetic colours, mineral oil, silicone, SLS and SLES or parabens, don’t test on animals and look after their bees, support the countryside and bee keeping initiatives. They are good ones; overall a lovely company brimming with amazing products. The Bee Good Serum costs £25 and is available from Waitrose, which has a great beauty range including Bee Good. Hello all. I am about to write about something that is not inspiring me much this year: Valentine’s day. Yes, sounds a bit bitter, and I am usually a big fan of the day, but my boyfriend is away for work and I will spend my evening alone. Well, not alone – I booked myself a lovely facial and massage at the Elemis spa (which I will be reviewing), so that will detract from the fact I should be sipping some champagne in a romantic setting! This H&M stripey dress – For a great figure! The back of Miss Selfridge cream bow dress – So cute! And some shoes, of course! I usually like to pamper myself; put a face mask on before the date; I tried the Elemis freshskin deep purifying mask, followed by their magical moisture quenching face mask and woke up with calm, soft skin. Love it! 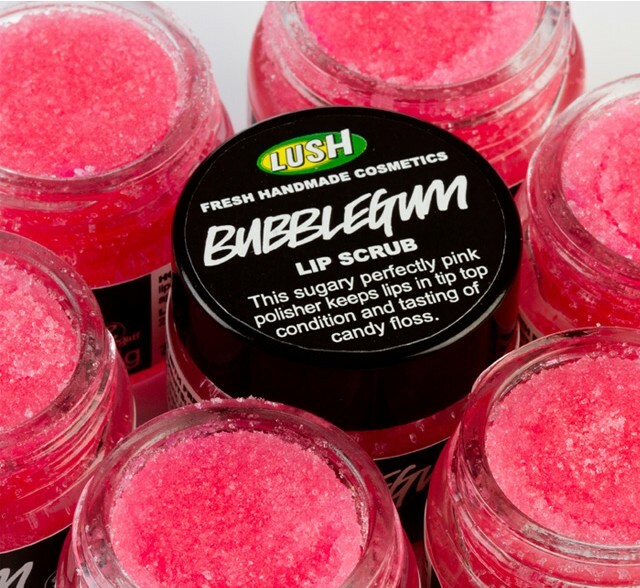 For extra soft kissable lips, I found a favourite: Lush Bubblegum lip scrub. It is made of sugar, tastes amazing and you can eat it afterwards (I know, right?). I wear it daily, in the morning, then apply my favorite lip balm (at the moment, Nivea lip butter). How about a little treat for the couple? 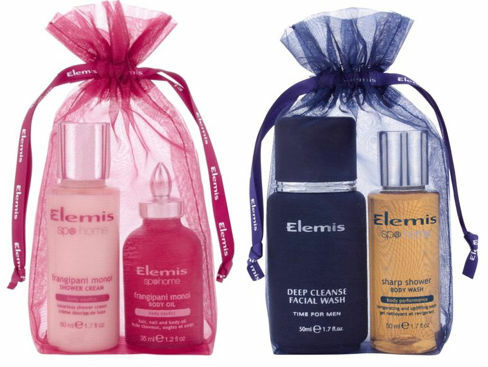 I came across this cute Elemis couples’ kits – for her, an Exotic Frangipani Monoi body oil and a bath and shower cream; for him, a Sharp Shower Body Wash (with invigorating spearmint and peppermint essentials oils) and a Time For Men deep cleanse facial wash. They retail at £12 each. I have the Frangipani body oil and it is amazing – the smell is lovely, it absorbs well in the skin and leaves you really moisturised and soft – I will post the full review soon! You can buy these lovely sets here. Ladurée macaroons are also a very nice little treat! I am a big fan – they are really the best and their little boxes are super cute…. If you are in London, I find there are so many options of lovely places to go with your loved one. I know that they are overpriced, but sometimes it is just worth going for the experience. There are so many amazing options… For example, Altitude 360 is doing a romantic 5-course with a glass of champagne each for £99. Searcy’s champagne bar offers a special menu and their champagne selection is fantastic, but my favourite has to be the Wallace restaurant at the Wallace Collection, set in a beautiful courtyard in central London, and amazing value for money, at under £30 pp for the set menu. The London Eye has special Valentine’s flights with champagne from £35.04 (online booking price). Staying in? Waitrose is doing a special twist on their dine-in deal: a three-course meal and a bottle of bubbly for £20! This year, we had a play booked for the day before Valentine’s (we managed to re-book for the following week!) – and I think this is a nice way of spending the evening with the loved one! However, the most important thing is that you have each other and have fun spending time together!